Reinforcement Learning (RL) is the trending and most promising branch of artificial intelligence (AI). Hands-On Reinforcement Learning with Python will help you master not only basic reinforcement learning algorithms but also advanced deep reinforcement learning (DRL) algorithms. The book starts with an introduction to reinforcement learning followed by OpenAI Gym and TensorFlow. You will then explore various RL algorithms and concepts, such as Markov decision process, Monte Carlo methods, and dynamic programming, including value and policy iteration. This example-rich guide will introduce you to deep reinforcement learning algorithms, such as dueling DQN, DRQN, A3C, PPO, and TRPO. You will also learn about imagination-augmented agents, learning from human preference, DQfD, HER, and many more of the recent advancements in reinforcement learning. By the end of this book, you will have all the knowledge and experience needed to implement reinforcement learning and deep reinforcement learning in your projects, and you will be all set to enter the world of artificial intelligence. 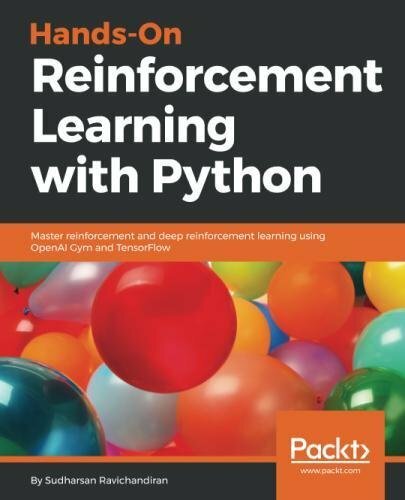 Hands-On Reinforcement Learning with Python is for machine learning developers and deep learning enthusiasts interested in artificial intelligence and want to learn about reinforcement learning from scratch. Some knowledge of linear algebra, calculus, and the Python programming language will help you understand the concepts covered in this book. View More In Human-Computer Interaction.